The Sinner's Prayer: Modern apostasy and false teaching that prevents men from being saved. "Modern apostasy and false teaching that prevents men from being saved." The earliest notion of sinners prayer is less than 500 years old. It wasn't formalized as a theology until around the time of Billy Graham. No one in the Bible ever prayed for their initial salvation. They did however believe, repent, confess Jesus and be immersed in water for the forgiveness of their sins. 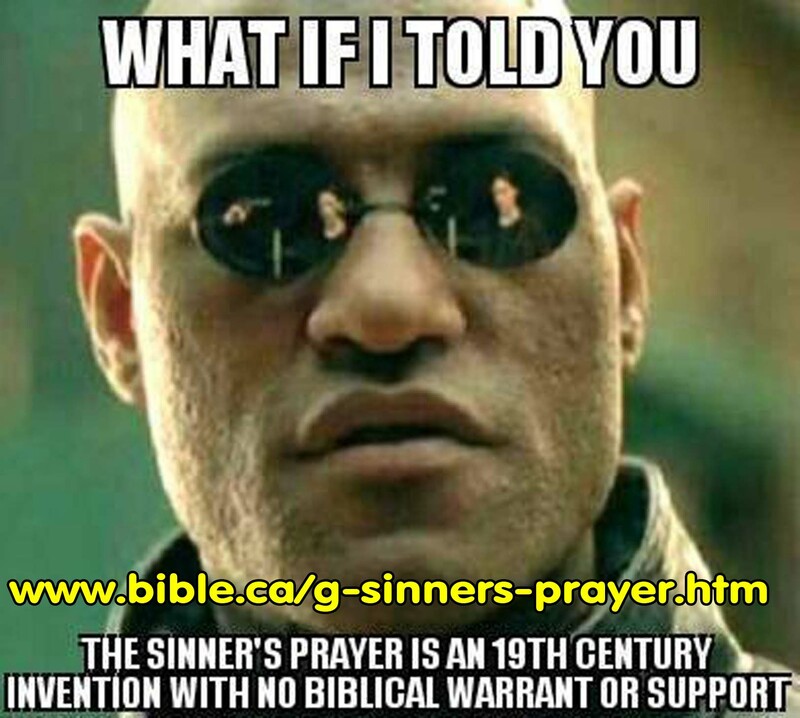 The sinners prayer is a an innovation that thwarts God's plan of salvation. 1. First they replaced believers baptism by immersion with infant baptism by sprinkling. 2. Second they later replaced baptism altogether with the "sinners prayer" so that baptism is no longer even part of the plan of salvation. If you prayed the "sinners prayer" for your salvation, you are still lost in your sins, because it is not what God said to do. C.S. Lewis used the term "a great cataract of nonsense" to describe how people use a modern idea to construe Bible theology. One such example, perhaps the best example, is a conversion method called the Sinner's Prayer. It is more popularly known as the Four Spiritual Laws. Lewis used this term to describe what happens when someone looks backward at the Bible based only on what he or she has known. Instead, an evangelical should first discern conversion practices from Scriptures and then consider the topic in light of two thousand years of other thinkers. As it is, a novel technique popularized through recent revivals has replaced the biblically sound practice. Today, hundreds of millions hold to a belief system and salvation practice that no one had ever held until relatively recently. The notion that one can pray Jesus into his or her heart and that baptism is merely an outward sign are actually late developments. The prayer itself dates to the Billy Sunday era; however, the basis for talking in prayer for salvation goes back a few hundred years. "Just accept Christ into your heart through prayer and he'll receive you. It doesn't matter what church you belong to or if you ever do good works. You'll be born again at the moment you receive Christ. He's at the door knocking. You don't even have to change bad habits, just trust Christ as Savior. God loves you and forgives you unconditionally. Anyone out there can be saved if they ... Accept Christ, now! Let us pray for Christ to now come into your heart." Sound familiar? This method of conversion has had far-reaching effects worldwide as many have claimed this as the basis for their salvation. Yet, what is the historical significance of this conversion? How did the process of rebirth, which Jesus spoke of in John 3, evolve into praying him into one's heart? I believe it was an error germinating shortly after the Reformation, which eventually caused great ruin and dismay in Christendom. By supplying a brief documentation of its short, historical development, I hope to show how this error has served as "a great cataract of nonsense". Although things weren't ideal after the Reformation, for the first time in over a thousand years the general populace was reading the Scriptures. By the early 1600s, one hundred years after the Reformation was initiated, there were various branches of European Christendom that followed national lines. For instance, Germans followed Martin Luther. There were also Calvinists (Presbyterian), the Church of England (Episcopalian), various branches of Anabaptists and, of course, the Roman church (Catholics). Most of these groups were trying to revive the waning faith of their already traditionalized denominations. However, a consensus had not been reached on issues like rebirth, baptism or salvation--even between Protestants. The majority still held to the validity of infant baptism even though they disagreed on its significance. Preachers tended to minimize baptism because people hid their lack of commitment behind sayings like "I am a baptized Lutheran and that's that." The influence of the preachers eventually led to the popular notion that one was forgiven at infant baptism but not yet reborn. Most Protestants were confused or ambivalent about the connection between rebirth and forgiveness. The Great Awakening was the result of fantastic preaching occurring in Europe and the eastern colonies during the early to mid 1700s. Though ambivalent on the practice of baptism, Great Awakening preachers created an environment that made man aware of his need for an adult confession experience. The experiences that people sought were varied. Jonathan Edwards, George Whitfield and John Wesley furthered ideas of radical repentance and revival. Although there is much to be learned from their messages, they did not solve the problems of the practices associated with baptism and conversion. Preachers heavily relied on Revelation 3:20. By using the first-person tense while looking into the sinner's eyes, preachers began to speak for Jesus as they exhorted, "If you would just let me come in and dine with you, I would accept you." Even heathens who had never been baptized responded with the same or even greater sorrow than churchgoers. As a result, more and more preachers of Christendom concluded that baptism was merely an external matter--only an outward sign of an inward grace. In fact, Huldreich Zwingli put this idea forth for the very first time. Nowhere in church history was such a belief recorded. It only appears in Scripture when one begins with a great cataract of nonsense. In other words, it only appears in the New Testament through the imagination of readers influenced by this phenomenon. A method originated during the 1730s or '40s, which was practically forgotten for about a hundred years. It is documented that in 1741 a minister named Eleazar Wheelock had utilized a technique called the Mourner's Seat. As far as one can tell, he would target sinners by having them sit in the front bench (pew). During the course of his sermon "salvation was looming over their heads." Afterwards, the sinners were typically quite open to counsel and exhortation. In fact, as it turns out they were susceptible to whatever prescription the preaching doctor gave to them. According to eyewitnesses, false conversions were multiplied. Charles Wesley had some experience with this practice, but it took nearly a hundred years for this tactic to take hold. In 1801 there was a sensational revival in Cane Ridge, Kentucky that lasted for weeks. Allegedly, people barked, rolled over in the aisles and became delirious because there were long periods without food in the intense heat. It resulted in the extreme use and abuse of emotions as thousands left Kentucky with wild notions about rebirth. Today it is generally viewed as a mockery to Christianity. "The appeals, songs, prayers and the suggestion from the preacher drive many into the trance state. I can remember in my boyhood days seeing ten or twenty people laying unconscious upon the floor in the old country church. People called that conversion. Science knows it is mesmeric influence, self-hypnotism ... It is sad that Christianity is compelled to bear the folly of such movements." (J.V. Coombs, Religious Delusions, 92ff). The Cane Ridge Meeting became the paradigm for revivalists for decades. A lawyer named Charles Finney came along a generation later to systemize the Cane Ridge experience through the use of Wheelock's Mourner's Seat and Scripture. "The church has always felt it necessary to have something of this kind to answer this very purpose. In the days of the apostles, baptism answered this purpose. The gospel was preached to the people, and then all those who were willing to be on the side of Christ, were called out to be baptized. It held the place that the anxious seat does now as a public manifestation of their determination to be Christians"
Finney made many enemies because of this innovation. The Anxious Seat practice was considered to be a psychological technique that manipulated people to make a premature profession of faith. It was considered to be an emotional conversion influenced by some of the preachers' animal magnetism. Certainly it was a precursor to the techniques used by many twentieth century televangelists. In opposition to Finney's movement, John Nevin, a Protestant minister, wrote a book called The Anxious Bench. He intended to protect the denominations from this novel deviation. He called Finney's New Measures "heresy", a "Babel of extravagance", "fanaticism", and "quackery". He also said, "With a whirlwind in full view, we may be exhorted reasonably to consider and stand back from its destructive path." It turns out that Nevin was somewhat prophetic. The system that Finney admitted had replaced biblical baptism, is the vertebrae for the popular plan of salvation that was made normative in the twentieth century by the three Bills --- Billy Sunday, Billy Graham and Bill Bright. However, it wasn't until the end of Finney's life that it became evident to everyone and himself that the Anxious Bench approach led to a high fallout rate. By the 1860s Dwight Moody (1837-1899) was the new apostle in American evangelicalism. He took Finney's system and modified it. Instead of calling for a public decision, which tended to be a response under pressure, he asked people to join him and his trained counselors in a room called the Inquiry Room. Though Moody's approach avoided some of the errors encountered in Finneyism, it was still a derivative or stepchild of the Anxious Bench system. In the Inquiry Room the counselors asked the possible convert some questions, taught him from Scripture and then prayed with him. The idea that prayer was at the end of the process had been loosely associated with conversion in the 1700s. By the late 1800s it was standard technique for 'receiving Christ' as Moody's influence spread across both the United States and the United Kingdom. This was where a systematic Sinner's Prayer began, but was not called as such until the time of Billy Sunday. R. A. Torrey succeeded Moody's Chicago-based ministry after his death in 1899. He modified Moody's approach to include "on the spot" street conversions. Torrey popularized the idea of instant salvation with no strings attached, even though he never intended as much. Nonetheless, "Receive Christ, now, right here" became part of the norm. From that time on it became more common to think of salvation outside of church or a life of Lordship. Meanwhile in Chicago, Billy Sunday, a well-known baseball player from Iowa, had been converted in the Pacific Garden Mission. The Mission was Chicago's most successful implementation of Moody's scheme. Eventually, Sunday left baseball to preach. He had great public charm and was one of the first to mix ideas of entertainment with ministry. By the early 1900s he had become a great well-known crusade leader. In his crusades he popularized the Finney-Moody method and included a bit of a circus touch. After fire and brimstone sermons, heavy moralistic messages with political overtones, and humorous if not outlandish behavior, salvation was offered. Often it was associated with a prayer, and at other times a person was told they were saved because they simply walked down his tabernacle's "sawdust trail" to the front where he was standing. In time people were told they were saved because they publicly shook Sunday's hand, acknowledging that they would follow Christ. Billy Sunday died in 1935 leaving behind hundreds of his imitators. More than anything else, Billy Sunday helped crusades become acceptable to all denominations, which eventually led to a change in their theology. Large religious bodies sold out on their reservations toward these new conversion practices to reap the benefits of potential converts from the crusades because of the allure of success. Both Dwight Moody and Billy Sunday admitted they were somewhat ignorant of church history by the time they had already latched on to their perspectives. This is highly significant because the Anxious Seat phenomenon and offshoot practices were not rooted in Scripture nor in the early church. Later, in 1977 Billy Graham published a now famous work entitled, How to Be Born Again. For all the Scripture he used, he never once uses the hallmark rebirth event in the second chapter of the book of Acts. The cataract (blind spot) kept him away from the most powerful conversion event in all Scripture. It is my guess that it's emphasis on baptism and repentance for the forgiveness of sins was incompatible with his approach. The bolded words have no support at all in the original Greek. They are a blatant insertion placed by presuppositions of the translator, Kenneth Taylor. I'm not sure that even the Jehovah's Witnesses have authored such a barefaced insertion in their corrupt Scriptures. 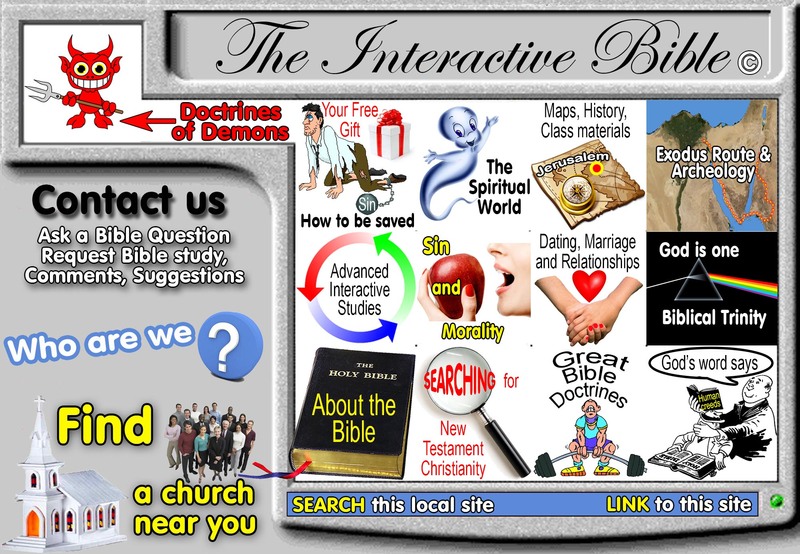 In defense of Taylor's original motives, the Living Bible was created primarily with children in mind. However, the publishers should have corrected the misleading verse in the 1960s. They somewhat cleared it up in the newer LB in the 1990s, only after the damage has been done. For decades mainstream evangelicals were using the LB and circular reasoning to justify such a strong 'trusting moment' as salvation, never knowing their Bible was corrupted. A whole international enterprise of publishers, universities and evangelistic associations were captivated by this method. The phrases, "Receive Christ," and "Trust Jesus as your personal savior," filled airwaves, sermons, and books. James Kennedy's Evangelism Explosion counselor-training program helped make this concept of conversion an international success. Missionaries everywhere were trained with Sinner's Prayer theology. Evangelicalism had the numbers, the money, the television personas of Graham and Kennedy and any attempt to purport a different plan of salvation would be decried as cultic and "heresy." While most do this unknowingly, evangelicals are skewing church auditoriums all over the world from a clear picture of conversion with a nonsensical practice. Written and copyright by Steven Francis Staten. This article is an overview of a book being written on the origins of the Sinner's Prayer.